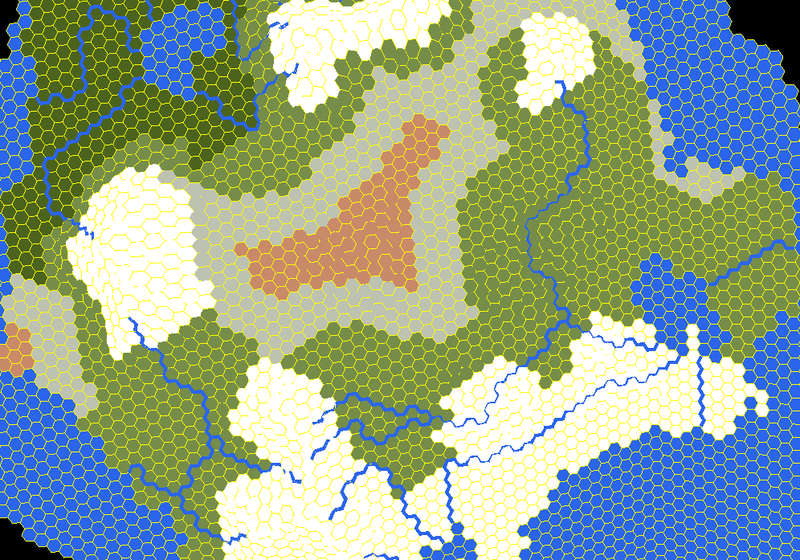 Each vertex has attibute that holds the biome type, I can also add special attributes to the vertices on the edge between two biomes, but I just don't seem to be able to figure out how to pull this off in shader code, obviously noise is involved here, but how do I make it continous across multiple faces and entire border of multiple biomes? Other answers here suggest using a texture. Here's a technique that doesn't use textures. 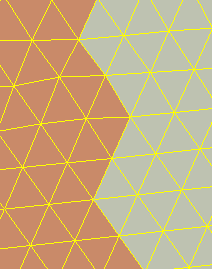 The boundaries between hexagons are now in the middle of the rendered triangles, so that'll let us do more interesting things with them. Bonus: you only need to draw two triangles per hexagon, instead of six (or twenty four as you are doing now). 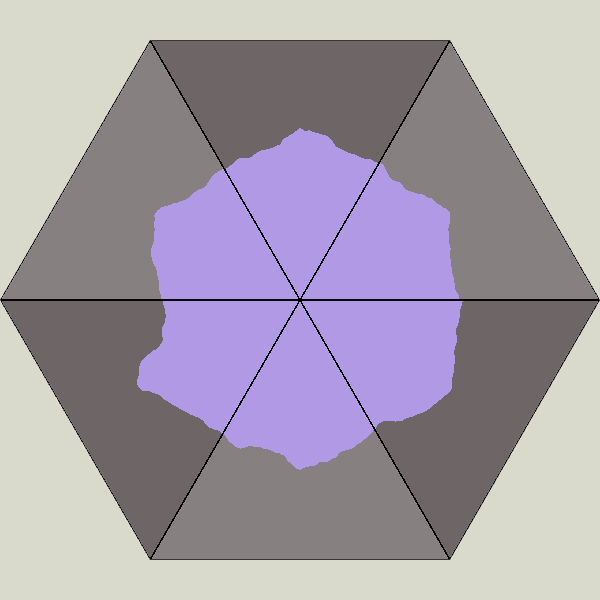 Inside each of those triangles we want the fragment shader to draw the hexagons. We can do that with barycentric coordinates. Put (1,0,0), (0,1,0), and (0,0,1) at each vertex of the triangle. Inside the triangle, those coordinates will be interpolated. 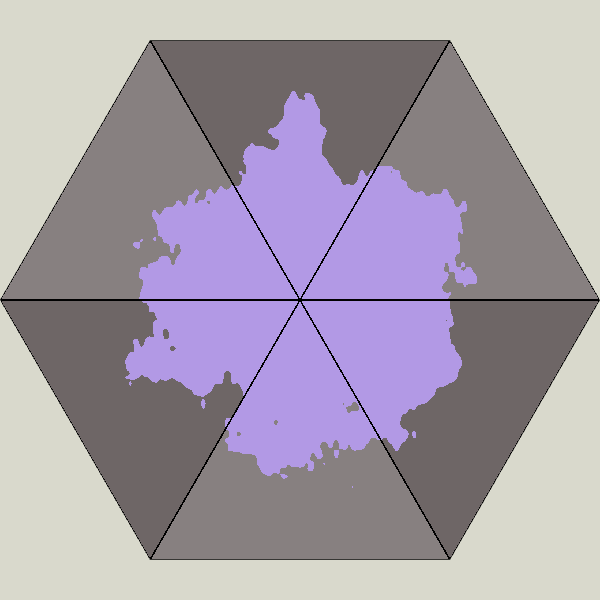 The fragment shader will receive (a,b,c) and can look to see which value is largest — that will tell us which of the three hexagons should be drawn at this point. You need to be careful with the noise, making sure it's consistent across triangle boundaries. One way to do that is to pass in a hex id and use that as the seed value for each of the three noise values added to the barycentric coordinates. I'm sure that "could" be solved with some image algorithm but if it was me I'd probably solve it with textures. 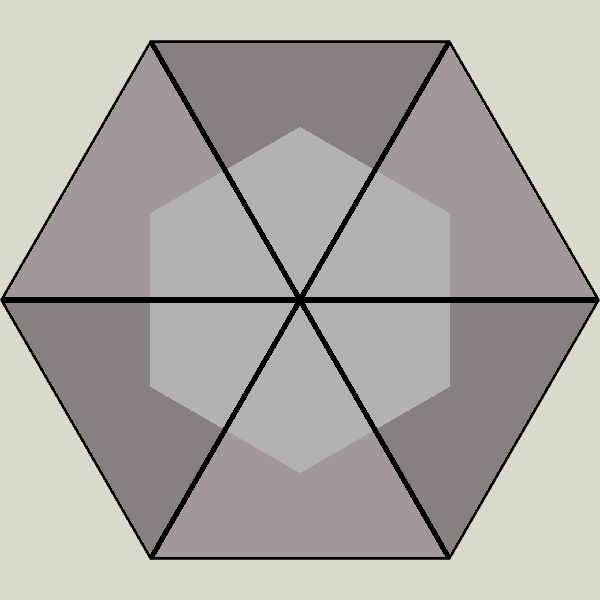 I'd make hexagonal textures, put them all in a texture atlas, then for each hexagon I'd look at its neighbors and decide which texture to apply. The textures would need to have versions for each type of terrain plus versions for each type of transition. This is similar to how many tile based systems do terrain. Here's an example from 2d games. Another possibility would be to just have your textures for your various types of terrain (water, snow, dirt, grass) and add mix amounts to each vertex of hexagon to decide how to mix them. This article shows the idea of mixing terrain textures. I'm not suggesting following their implementation but it shows the idea. // frequency and magnitude of the noise in texels. // This one isn't great, but you can experiment. // position of the fragment. where noise is some pseudo-random function (using, say, sinusoids) on the 3D position of the vertex in model space which returns a noisy offset to the texture coordinate. Sample the texture using GL_NEAREST to keep sharp borders. Not the answer you're looking for? Browse other questions tagged opengl shaders webgl terrain-rendering noise or ask your own question. Updating texture memory via shader?